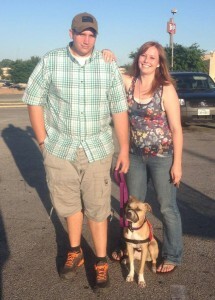 Meet new client, Wounded Warrior Bradley, who is dealing with PTSD, his beautiful wife Heather, and their SDIT, Ginger! Bradley and his family moved here from Ft. Hood three months ago to be near family, but it was a difficult transition for them leaving behind the military family and friends they had bonded with. It’s been a difficult time for all of them – married for three years, dealing with PTSD (it took a long time for Bradley to acknowledge he had it, understandably), but Heather could see it and now, here, they have a good doctor who is working with them to start the healing process. I also put them in contact with some other military families and the Wounded Warrior Project to help them get assimilated and let them know that they are certainly not alone!! Ginger is as cute as a button! She is a boxer mix, but on the smaller side. Bradley and Heather have already done so much work training her on their own – she knows all basic commands and heels perfectly. The first session, we just talked at their home about all they had gone through and how Bradley and Heather would like Ginger to help, and we went through “sit”, “down”, “stay”, “leave it”, etc. 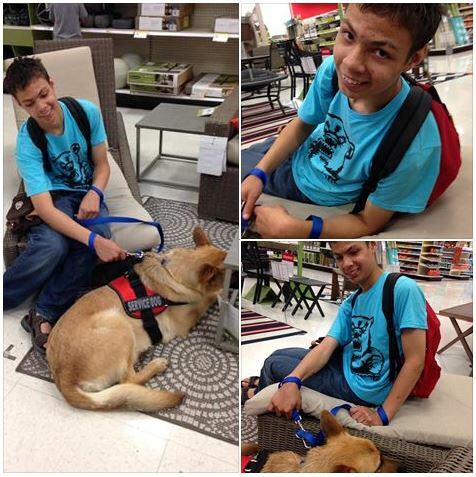 The next outing, we went to Petsmart, and Ginger was just wonderful. She heels with no problems, responds to “leave it” with distractions, gets along with all the dogs she meets – big or small (we did some training with Wounded Warrior Anthony and his SD Tucker and his wife Rowena and her SDIT Blessed), and they all just got along like peas in a pod! Of course, we will do more training in public, but the main thing Bradley needs help with is what many of us with “invisible disabilities” need to deal with – what to say when someone comes up (kindly), asks to pet your Service Dog (to which Bradley usually says yes), and the inevitable question, “What does your Service Dog do for you?” It only happened a few times, but I explained to Bradley that the answer is ALWAYS his choice. He doesn’t have to answer, he can say “She helps me with my daily functioning”, “She is my medical alert dog” (remember – PTSD and all psychiatric disabilities are medical conditions), or he can talk about being a Wounded Warrior with PTSD. I reminded him that he will face this question often, and his response may differ given the situation he is in, but ultimately it is up to him. Yes, revealing how a Service Dog can help Wounded Warriors with PTSD can be educating and helpful for people who don’t know, but ultimately, it is Bradley’s business. 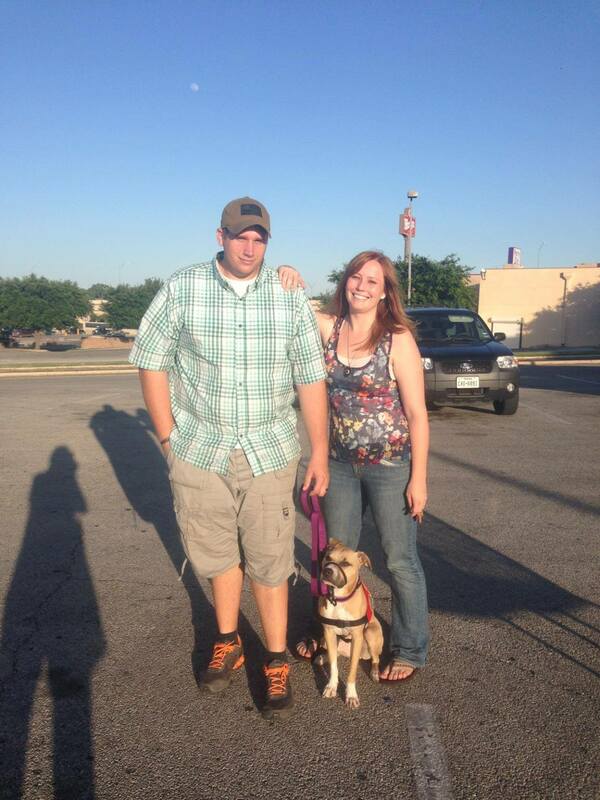 So, they as a family will be figuring this out and I know Ginger will be a wonderful help for Bradley and Heather!!! “Amongst these pictures is one that I look at and just can’t take my eyes off of… Others, I see Trooper as Trooper and it makes me cry all over again. You can see his pride, his affection, his strength, his warrior attitude in almost all of these, and in the rest of them, you can see how much he loved his Momma. There is also a picture here of me and Trooper with the Marlin, TX Fire Department. They stopped us and asked for a picture, and then talked with us for HOURS. If I’m not mistaken, they actually have this hanging up in the Fire House now. They said they wanted a copy of it so they could do that. They loved Trooper, and it breaks my heart to know that I have to tell them that he’s passed. I have yet to do that. 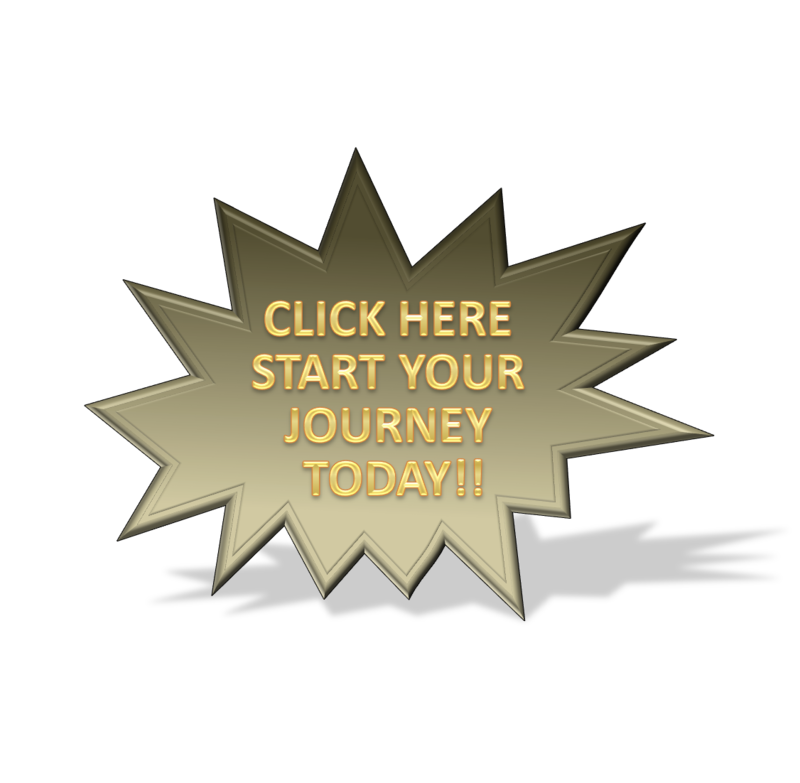 Any clients that have experienced Conversion Disorder, there is a young client who has this and would love to talk to someone who understands what she is going through. If you would be willing to make contact with her, please email me at [email protected]. Thank you. From trainer Letty, who has been training with 16 year-old Brayton, who is intellectually disabled, legally blind, has ataxic cerebral palsy, and speech language delay. He and his mother are working with Letty consistently.